Deutsch Konopath (now Wielki Konopat, Poland). 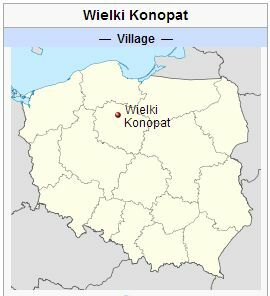 Deutsch Konopath was a settlement in West Prussia composed of two villages: Groß Deutsch Konopath (also known as Wielki Konopat Niemiecki, Groß Deutsch Konopat, and Hanfdorf; now known as Wielki Konopat; coordinates: 53.4, 18.366667 [53° 24′ 0″ N, 18° 22′ 0″ E]; population in 1773, 247, in 1905, 305); and Klein Deutsch Konopath (also known as Mały Konopat Niemiecki, Klein Deutsch Konopat, and Hanffelde; now known as Mały Konopat; coordinates: 53.386016, 18.366136 [53° 23′ 09″ N, 18° 21′ 58″ E]; population in 1905, 45). It is located approximately 5 kilometres (3 miles) south-west of Świecie (Schwetz), and 44 km. (27 miles) north of Toruń (Thorn). In the 19th century it was located west of Przechovka (Wintersdorf) in the district of Schwetz, on the Vistula River, in West Prussia. Until 1772 Deutsch Konopath was located in what was known as Royal Prussia (also known as Polish Prussia) in the Kingdom of Poland. The First Partition of Poland in 1772 resulted in the creation of a new province on 31 January 1773, called West Prussia, in which Deutsch Konopath was located. 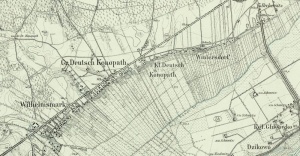 Deutsch Konopath was situated in the district (Kreis) of Schwetz in Regierungsbezirk Marienwerder until the end of World War I, when it came under the jurisdiction of the Pomeranian Voivodeship of the Second Polish Republic. Deutsch Konopath came under the control of Nazi Germany during World War II until March 1945, when it was occupied by Soviet forces and returned to Poland. In 2013 Wielki Konopat and Mały Konopat were villages in the administrative district of Gmina Świecie, within Świecie County, Kuyavian-Pomeranian Voivodeship. It was a village where Mennonites lived (in 1772 one-third of the population was Mennonite), who, together with those of Przechovka, formed a congregation of the Groningen Old Flemish branch. Two elders from the Netherlands, Alle Derks and Hendrik Berends (Hulshoff), who visited the Mennonites of Konopath shortly after 1700 and 1719, made a list of all the names of the members. In this list well-known West Prussian names are found, such as Raatslof (Ratzlaf), Tesmer, Nagtegaal (Nagtigal), Voet (Foth), Smit (Schmidt), Jans, Jansen, Boeler (Buhler), Isaachs, Onrouw (Unruh). In 1719 the group of Mennonites at Konopath (in the Dutch sources called Kunpad or Koenpat) numbered 52. The Prussian census of 1776 lists 16 Mennonite families in Deutsch Konopath with the following surnames: Bueller, Pankratz, Ratzlaff, Schmidt, Tessmer, Unrau, and Wiedel. This congregation, regularly found in the Dutch [[Naamlijst der tegenwoordig in dienst zijnde predikanten der Mennoniten in de Vereenigde Nederlanden|Naamlijst]], immigrated to the Molotschna Mennonite settlement in South Russia in 1819-1820 and 1823-1824. "Bezoekreis van Hendrik Berends Hulshoff." Bijdragen en mededelingen van het Historisch Genootschap 59 (1938): 75, 79. Duerksen, J. A. "Przechowka and Alexanderwohl." Mennonite Life 10 (April 1955): 76-82. "Familienforschung in Westpreußen." Hans-Jürgen Wolf. Web. 29 September 2012. http://www.westpreussen.de. Thiessen, Richard D. "Deutsch Konopath (Kuyavian-Pomeranian Voivodeship, Poland)." Global Anabaptist Mennonite Encyclopedia Online. March 2013. Web. 18 Apr 2019. http://gameo.org/index.php?title=Deutsch_Konopath_(Kuyavian-Pomeranian_Voivodeship,_Poland)&oldid=141085. Thiessen, Richard D. (March 2013). Deutsch Konopath (Kuyavian-Pomeranian Voivodeship, Poland). Global Anabaptist Mennonite Encyclopedia Online. Retrieved 18 April 2019, from http://gameo.org/index.php?title=Deutsch_Konopath_(Kuyavian-Pomeranian_Voivodeship,_Poland)&oldid=141085. Adapted by permission of Herald Press, Harrisonburg, Virginia, from Mennonite Encyclopedia, Vol. 3, p. 222. All rights reserved. This page was last modified on 20 November 2016, at 07:31.